You've found the “U.S. Hereford Pig Breeders” page here at Hobby Farm Wisdom! If this is the first time you have visited our site: Welcome! 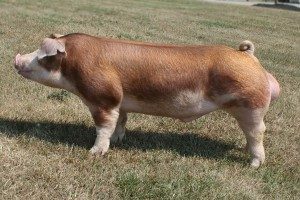 Hereford is a rare American breed of domestic pig that is named after its similar appearance to the Hereford cattle. Like the Hereford cattle, this breed of pig is red with a white face. Herefords were developed from breeding Duroc, Poland China and possibly Chester White or Hampshire pigs in the early 1920s. They are a medium to large sized pig, typically weighing 200 – 250 pounds by 6 months of age. At maturity, they weigh between 600 – 800 pounds. These pigs have been bred for both their unique appearance and performance. The calm temperament of most Hereford pigs make them a good breed for use in 4-H and other programs.